This Mini Missing Manual takes you down the virtual rows of Apple's iBookstore, to help you find, buy, and download books and subscribe to magazine and newspapers on your iPad. You'll learn now to navigate your books and periodicals and sync them back to iTunes to swap them on and off your iPad to free up storage space. In addition, you'll find out where to get free books in the iBookstore, and where you can shop for iPad-compatible books, both free and for-pay, outside of Apple's domain. Finally, you'll learn the fine art of eBook navigation, including how to change a book's font and font size, add bookmarks, highlight special passages, dynamically look up words in the dictionary, andsearch through your iBooks. 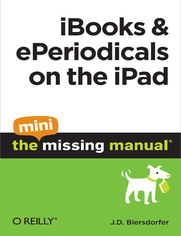 This Mini Missing Manual is excerpted from the book iPad: The Missing Manual.